Born Wisconsin Rapids, Wisconsin, September 16, 1975; married; 6 children. Graduate Lincoln High School, 1993; attended University of Wisconsin–Stevens Point; A.D. Mid-State Technical College, 1999; B.A.S. in Psychology, University of Wisconsin–Green Bay, 2008. Employment and training specialist. Former Wood County drug court coordinator, jail discharge planner; Juneau County sheriff’s deputy. Member: Heart of Wisconsin Chamber of Commerce; Wisconsin Rapids Rotary. 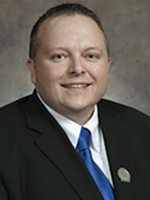 Recipient: Wisconsin Industrial Energy Group Legislator of the Year Award 2014; Dairy Business Association Legislative Excellence Award 2014, 2012; Wisconsin Paper Council Legislator of the Year 2014; Child Support Enforcement Association Legislator of the Year 2014; League of Conservation Voters Honor Roll 2014; Wisconsin Troopers Association Legislator of the Year 2014; Wisconsin Counties Association Outstanding Legislator 2014; WMC Working for Wisconsin Award 2016, 2014, 2012; Third Congressional District State Legislator of the Year 2012.